You are here: Home>Bottesford Parish 1st World War Centenary Project>1st World War Service Biographies>Survivor biographies>John Francis Tufnell Barrett, D.S.O. and bar, D.F.C. Photograph of Margaret Barrett, sister of Tufnell Barrett. Her uniform may be that of the Queen Mary's Army Auxiliary Corps, a women's unit within the British army, but it also has similarity to the Land Army uniform. 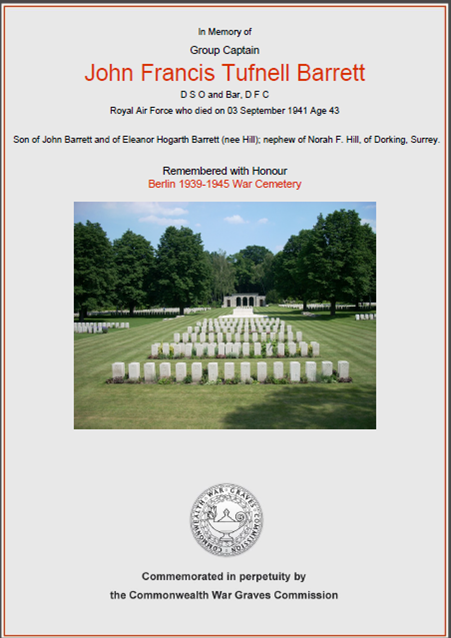 Group Captain Barrett, who died during an air raid over Berlin in 1941, had originally enlisted in 1916. His military career, with the RFC and RAF, started during the First World War, spanned the interwar years, and ended with his distinguished service in the first part of the Second World War. Though not recorded in the censuses of 1901 and 1911 for Muston and Bottesford, he was included in the Muston Absentee Voters List of 1918 which gives his home address as Muston Rectory. Absentee Voters Lists include the home address of the service personnel as well as their service number, rank and unit. However, there is no surviving central register of Absentee Voters, and many individual lists have not survived. We are fortunate in that the List for Bottesford and Muston is kept in the Leicestershire Record Office and Wigston Magna, and it was this that drew our attention to 2nd Lieutenant John Barrett, RAF, of The Rectory, Muston. 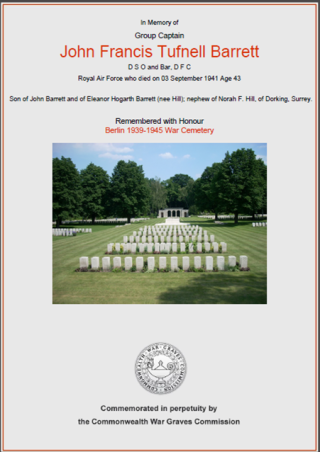 Information relating to John Barrett and his family background can be found in the censuses, especially those of 1891, 1901 and 1911, in the Register of Births, Marriages and Deaths (BMD), and in Kelly’s Directory of Leicestershire, 1916 ( link to University of Leicester ). John Barrett’s grandfather, Reverend Samuel Tufnell Barrett, was baptised on 27th October, 1833, at Shorne, Kent, son of Tufnell C. Barrett and Marianne Barrett. He married Louisia Cowper at St George’s, Hanover Square, Westminster, on 24th February 1857, and died in 1903 on the Isle of Wight. The Nottinghamshire History website (nottshistory.org.uk) provides a resume of his career. He gained his MA at Christ Church, Oxford, then after serving as a curate in Hereford and at Rusland, in the Furness District of Lancashire, he became Chaplain to Sir James Ramsden, High Sheriff of Lancashire. He was appointed as Vicar of St.George’s, Barrow-in-Furness. Barrow was a rapidly growing town, where Reverend Barrett was one of the founders of its hospital and also brought about the building of four new churches in the town, so that when he left in 1879 there were five churches serving its burgeoning population. He went on to be rector of Teversall, near Mansfield, for many years. His wife, Louisa, came from a distinguished Westmoreland gentry family, and they are reported to have had three sons in holy orders. The family included sons Frederick and Wilfred, and their sister Edith. In the 1911 census we find Frederick Lambert Tufnell Barrett (curate, a Clerk in Holy Orders) and his sister Edith Theodosia Kathleen Tufnell Barrett, together with their niece Margaret Helen Louisa Tufnell and governess Mary Baker, in Sneinton Dale, Nottingham. Presumably, he was the curate of Sneinton Vale. Kelly’s Directory, 1916, tells us that the Reverend Frederick Lambert Tufnell Barrett had been Rector of Muston since 1913. He was to die in Muston on the 29th June, 1928 (BMD). From 1913 to 1928 the Barretts resided in Muston, and this is the home address given by John Barrett. Newspaper clippings from the Grantham Journal indicate that it was also the home of Edith and Margaret Barrett, John Barrett’s aunt and sister, respectively. John Francis Tufnell Barrett, the subject of this account, was born in 1898 at Pleasley, Derbyshire. His father was John Basil Tufnell Barrett, a son of the Reverend Tufnell Samuel Barrett, whose birth was registered in the 3rd quarter of 1868 at Ulverston Registry Office, Lancashire. His mother was Eleanor Hogarth Barrett (nee Hill), who came from Westmoreland. He had a sister, Margaret Helen Louisa Tufnell Barrett born in 1897. In the 1891 census, John Basil Tufnell Barrett was recorded as a student, living with his parents in the Rectory at Teversall, near Mansfield. In the 1901 census he is a farmer and widower with two young children, living with his father and aunt at Teversall Rectory. During the ten years between the censuses he had married, seen the birth of his two children, and then the death of his wife, Eleanor. The BMD (General Register of Births, Marriages and Deaths) tells us that he remarried late in 1901, in Hackney, London, to Matilda Greene, and died in 1933 at Staines, Middlesex. It is unclear where Basil and Matilda Barrett lived. His father had died in 1903, so Teversall Rectory would no longer have been an option. He might have stayed with his brother at Sneinton and moved with him to Muston in 1913, but this has not been confirmed. It is perhaps more likely that he and his new wife set up home elsewhere, but if this is correct then we must suspect a rift in the family, in that Basil’s children adopted Muston as their home. 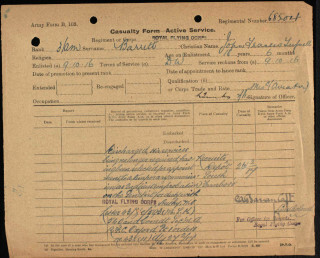 In the 1911 Census, John Francis Tufnell Barrett, aged 12, is recorded as a boarder at The Friary Preparatory School at Garlinge, near Margate in Thanet (Kent). When he enlisted in 1916, he would have been 18 years old, his schooling complete. It is tempting to draw an anaology with Cecil Lewis, who described is flying years in his autobiography “Sagittarius Rising”. Lewis enlisted with the Royal Flying Corps in 1915, aged only 17, straight from his school days at Oundle, and by 1916 he was flying over the battlefields of the Somme. Lewis was very fortunate to survive the war. He went on to have a brief post-war flying career before becoming part of the fledgling BBC. Barrett, who also survived the war, chose to remain in the RAF until his sad death in 1941, aged 43. 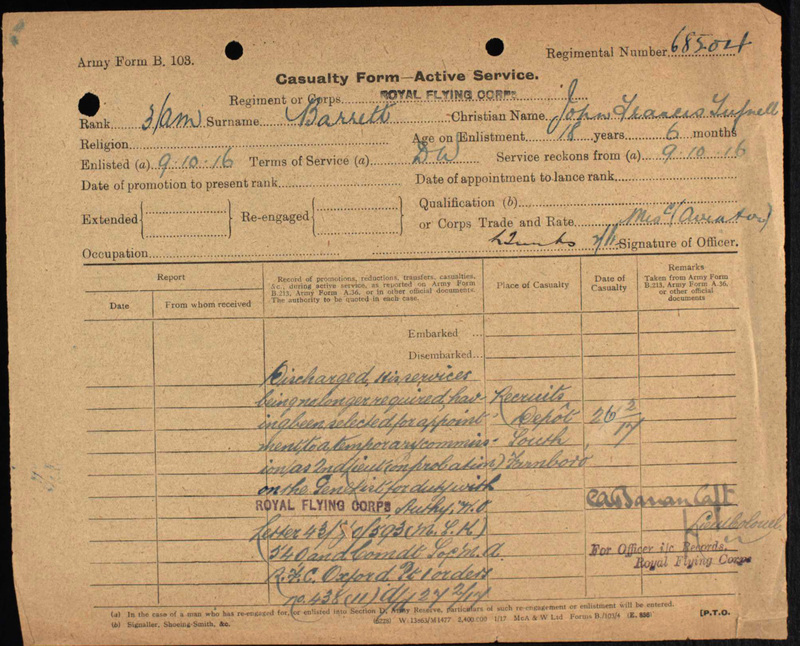 It appears most probable that John F T Barrett had gone to live with his uncle when he completed his education, and that this was still his address when he turned 18 and enlisted in 1916. Why he and his sister chose to live in Muston rather than with their father and step-mother is not recorded. The 1911 census also records John Francis Tufnell Barrett as a boarder aged 12 at Prep School, The Friary, Garlinge, Thanet (Kent). About John Francis Tufnell Barrett, D.S.O. and bar, D.F.C. 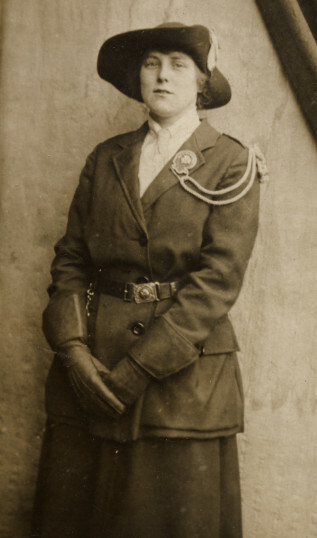 As someone who gives talks on women in the Army in the First World war, I can say that the uniform worn by Margaret Barratt is definitely not that worn by Queen Mary’s Army Auxiliary Corps. It is too dark and the hat is totally unlike any headgear worn by the Corps (or it predecessor the Women’s Army Auxiliary Corps). Neither Corps wore cross belts. I think it is one of the many women’s volunteer groups that sprang up in the First World War, but I cannot say which.